Part I: AUTOMOTIVE TECHNOLOGY. 1. Careers in the Automotive Industry. 2. Workplace Skills. 3. Basic Theories and Math. 4. 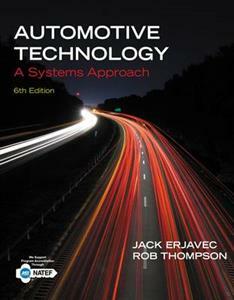 Automotive Systems. 5. Hand Tools and Shop Equipment. 6. Diagnostic Equipment and Special Tools. 7. Working Safely In the Shop. 8. Preventative Maintenance and Basic Services. Part II: ENGINES. 9. Automotive Engine Designs and Diagnosis. 10. Engine Disassembly and Cleaning. 11. Lower-End Theory and Service. 12. Upper-End Theory and Service. 13. Engine Sealing and Reassembly. 14. Lubricating and Cooling Systems. Part III: ELECTRICITY. 15. Basics of Electrical Systems. 16. General Electrical System Diagnostics and Service. 17. Batteries: Theory, Diagnosis, and Service. 18. Starting and Traction Motor Systems. 19. Charging Systems. 20. Lighting Systems. 21. Instrumentation and Information Displays. 22. Basics of Electronics and Computer Systems. 23. Electrical Accessories. Part IV: ENGINE PERFORMANCE. 24. Engine Performance Systems. 25. Detailed Diagnosis and Sensors. 26. Ignition Systems. 27. Ignition System Diagnosis and Service. 28. Diesel and Other Alternative Fuels. 29. Fuel Delivery Systems. 30. Electronic Fuel Injection. 31. Fuel Injection Diagnosis and Service. 32. Intake and Exhaust Systems. 33. Emission Control Systems. 34. Emission Control Systems Diagnosis and Service. 35. Hybrid Vehicles. 36. Electric Vehicles. Part V: MANUAL TRANSMISSIONS AND TRANSAXLES. 37. Clutches. 38. Manual Transmission and Transaxles. 39. Manual Transmission and Transaxle Service. 40. Drive Axles and Differentials. Part VI: AUTOMATIC TRANMISSIONS AND TRANSAXLES. 41. Automatic Transmissions and Transaxles. 42. Electronic Automatic Transmissions. 43. Automatic Transmission and Transaxle Service. 44. Four- and All-Wheel Drive. Part VII: SUSPENSION AND STEERING SYSTEMS. 45. Tires and Wheels. 46. Suspension Systems. 47. Steering Systems. 48. Restraint Systems. Theory, Diagnosis, and Service. 49. Wheel Alignment. Part VIII: BRAKES. 50. Brake Systems. 51. Drum Brakes. 52. Disc Brakes. 53. Antilock Brake, Traction Control, and Stability Control Systems. Part IX: PASSENGER COMFORT. 54. Heating and Air Conditioning. 55. Heating and Air Conditioning Diagnosis and Service. Jack Erjavec has become a fixture in the automotive textbook publishing world. He has decades of experience as a technician, educator, author, and editor, and has authored or co-authored more than 30 automotive textbooks and training manuals. Erjavec holds a master's degree in vocational and technical education from Ohio State University, and he spent twenty years at Columbus State Community College as an instructor and administrator. A long-time affiliate of the North American Council of Automotive Teachers, he also served as executive vice-president for the organization and spent several years on its board of directors. Erjavec is also associated with ATMC, SAE, ASA, ATRA, AERA, and other automotive professional associations. Rob Thompson has been teaching high school automotive technology since 1995. His teaching career began in 1994 as an adjunct faculty member at Columbus State Community College. Since 2007, Thompson has worked on numerous projects for Cengage Learning and is the author of AUTOMOTIVE MAINTENANCE & LIGHT REPAIR. He currently serves as vice-president and president-elect of the North American Council of Automotive Teachers.